Clinically asymptomatic, came for general adult medical exam. Generalized increase in bone density with loss of the normal medullary cavity in ribs. Sandwich appearance to the visualized spine. The patient came for for general adult medical exam. 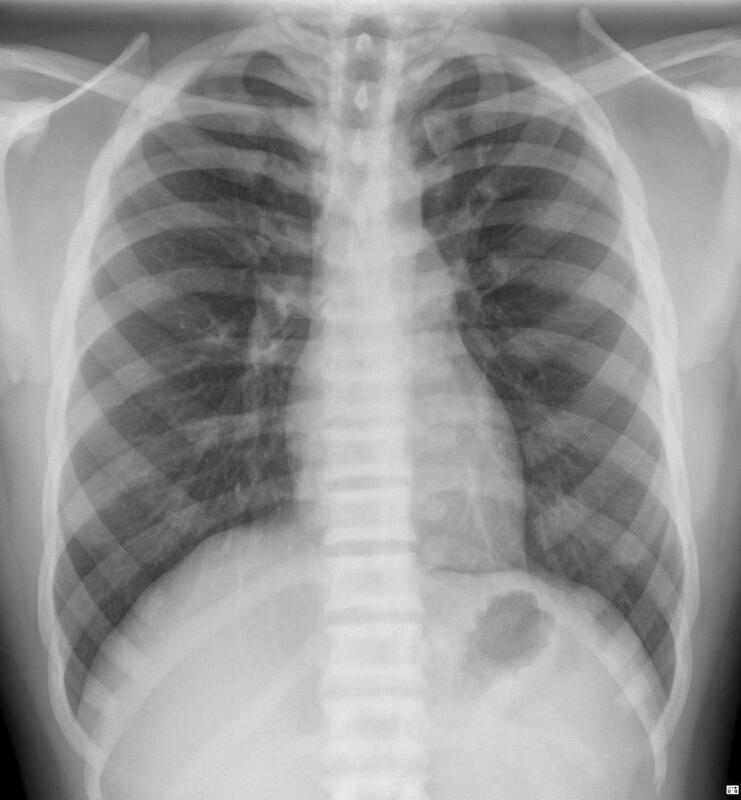 Chest x-ray showed generalized increase in bone density with loss of the normal medullary cavity (lost cortico-medullary differentiation) which was typical for osteopetrosis. A pelvic x-ray was be requested as additional study for confirmation. Autosomal dominant adult subtype was considered. Combining these factors with blood tests (i.e. dual marker) has been reported to achieve nearly 95% detection rate for trisomies. Which of the following statement is false regarding 11-13 weeks antenatal scan? with CRL more than 55 mm, if omphalocele is present, it increases the risk of trisomy 13 to 1:10 and trisomy 18 to 1:4 regardless of any other finding. Early pregnancy roughly spans the first ten weeks of the first trimester. Occasionally, early pregnancy is unintentionally imaged by CT or sometimes MRI is done for some concurrent pathology, and its important to know the imaging findings 3. If urinary pregnancy test is negative similar findings may suggest submucosal fibroid or retained products of conception. The earlier in pregnancy a scan is performed, the more accurate the age assignment from crown rump length. The initial age assignment should not be revised on subsequent scans 5. Theoretically, signal is proportional to the square of the static field strength (B0) whereas noise increases linearly. This implies that, in a perfect system, the signal-to-noise ratio (SNR) of a 3 T system would be twice as good as at 1.5 T. In reality, due to an increase in susceptibility effects in most tissues, the actual improvement is only in the 30-60% range (instead of 100%). With this increased SNR, the spatial resolution and/or acquisition time can be improved, depending on which is more important for the particular case. The dependence of SAR on flip angle results in a relatively large amount of energy deposition for standard spin echo sequences since they use 90-degree flip angles. As a result, there is increased use of gradient echo sequences, which use smaller flip angles. Unfortunately, these latter sequences image T2* and not T2, and are therefore more susceptible to local field artefacts. These problems have largely been overcome with modern units. Rapid gradient switching leads to an increase in the intensity of the acoustic noise, which requires better insulation of both the unit itself and the containing room. Three-dimensional (3D) ultrasound is a technique that converts standard 2D grayscale ultrasound images into a volumetric dataset. The 3D image can then be reviewed retrospectively. The technique was developed for problem-solving (particularly in obstetric/gynaecologic exams) and to potentially reduce the operator dependence of ultrasound imaging. Applications for 3D ultrasound obstetric imaging are also being developed, such as determining gestational sac location if there is a question of interstitial ectopic pregnancy. 3D gynaecologic imaging can be performed with either the transabdominal or endovaginal approach, but the endovaginal approach results in better quality images. The quality of the 3D images depends on the quality of the 2D images. The "Z-technique" is used in many institutions that practice 3D gynaecologic ultrasound. This technique may be found in detail in reference 2. Uses of 3D imaging for the uterine adnexa is currently being developed and may have a use in delineating tubal abnormalities, such as hydrosalpinx. 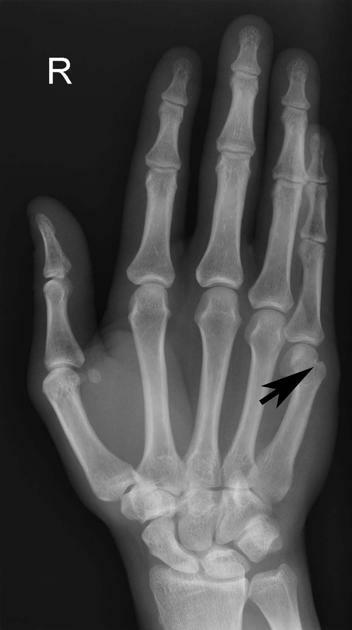 The 5th metacarpal pit refers to the normal exaggeration of the pit-like depression in the head of fifth metacarpal. It should not be mistaken for a fracture (old or new) or an erosion. The American Association for the Surgery of Trauma (AAST) injury scoring scales are the most widely accepted and used system of classifying and categorising traumatic injuries. Injury grade reflects severity, guides management, and aids in prognosis. Currently (early 2019), 32 different injury scores are available. Injury is classified according to either imaging, operative, or pathologic criteria - the highest classification is assigned the final AAST grade 2. Grading of spleen, liver, and kidney injuries has been validated, with increasing grades of injury correlating with increasing mortality, operative rate, and hospitalisation cost 3. In the last 1980s, the AAST formed an Organ Injury Scale (OIS) committee comprising trauma, orthopaedic surgery, urology, and neurosurgery specialists in order to create a more comprehensive classification. The first AAST OIS guidelines published in 1989 classified injuries of spleen, liver, and kidney 5. ABC/2 is a fast and simple method for estimating the volume of intracerebral haemorrhage (or any other ellipsoid lesion for that matter) which does not require volumetric 3D analysis or software. Intracerebral haemorrhage volume is an important predictor of morbidity and mortality (and thus trial eligibility) which is often under-reported 1. It has been well-validated and correlates highly with volumes calculated by planimetric techniques 2,3. If the measurements are made in centimetres (cm), then the volume will be in cubic centimetres (cm3). A baseline intracerebral haemorrhage volume of >50-60 mL is a poor prognostic marker 1,5.